Phoenix investment condos? Rental Tips. Phoenix Orange Beach is currently under construction and is projected to be finished in October 2018. This luxury condo development in Orange Beach features 112 units in 3/3 or 4/3 floor plan layouts. Amenities will include a lazy river, indoor/outdoor pools, hot tubs, fitness center, high speed elevators, and owner's storage. These highly desirable condos are centrally located in Orange Beach and will begin at $550,000 and up. Phoenix Orange Beach II is the newest pre-construction condo with a completion date slated for Fall 2020. Located in the heart of Orange Beach this development will offer 2, 3, and 4 bedroom gulf front units with a large array of amenities including a lazy river, multiple pools, fitness center, climate-controlled storage, and multi-level covered parking. Pre-sale prices start in the upper $500K for 2BR units to $900K+ for 4BR units. Phoenix Gulf Shores is the newest beachfront development in the heart of Gulf Shores, AL. Set in a prime location, these three- and four-bedroom units feature floor-to-ceiling windows, granite countertops, stainless steel appliances, wet bars, jacuzzi tubs, and large gulf facing balconies. Onsite amenities include indoor/outdoor pools, hot tubs, fitness center, meeting rooms, covered parking, and onsite management. Prices of units start around $600,000. 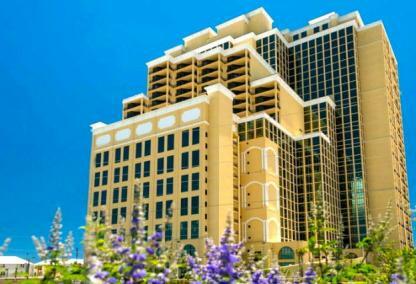 Phoenix West is the first Phoenix tower in Orange Beach as you leave Gulf Shores. It's hard to miss with over 200 units and over 20 stories high. 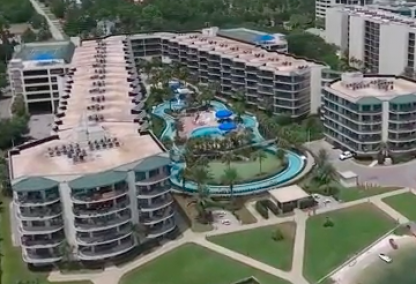 Features like lazy rivers, Olympic sized indoor pools and gym-size fitness rooms make this a special place directly on the Gulf of Mexico in Orange Beach Alabama. This particular project is much different that the other Phoenix developments with floor plans starting at 2,000 square feet. Phoenix West II is one of Orange Beach's newest luxury condominiums featuring three- and four-bedroom upscale units with prices starting at $500K and higher. The amenities of Phoenix West II are the same as the amenity package in the first Phoenix West and this enormous building will be a wonderful place to spend a week at the beach with family and friends. Condos at Phoenix West II make fantastic investments with bookings all year long. Phoenix X is comprised of 230 gulf front units and was finished in 2001. Phoenix X floor plans range from 800 to 1,400 square feet and prices start around $250,000. Phoenix X sits right next to the AL/FL state line and neighbors popular entertainment venue, the FloraBama lounge. The FloraBama is ranked one of the world's top beach bars year in and year out. It's home to the mullet toss which has been called the world's largest beach party. 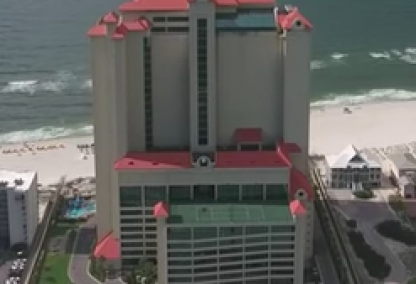 Phoenix IX was finished in 2007 and is home to 100 direct gulf front condos in East Orange Beach, AL almost in Perdido Key, FL. Some nice touches, like an indoor climate controlled tennis court and elevated pool over looking the Gulf of Mexico, make this Phoenix a great place in Eastern Orange Beach. Phoenix IX boasts larger than normal floor plans with 1,400 square foot 1BR units and 2,300 square foot 3BR's. The prices at Phoenix IX start around $300,000 for these condos a short drive from Florida. Phoenix East has 158 units while Phoenix East II houses only 72 gulf front condos. These 2 Phoenix towers were finished between 1996 and 1997. The floor plans range from 800 to 1430 square feet and prices start around $250,000 for the 1 bedroom units. These two Phoenix towers are located near the Perdido Pass bridge in the Eastern portion of Orange Beach, AL. Phoenix VI, Phoenix VII and Phoenix VIII all have the same great amenity package. The 230 units in Phoenix VI and the 247 units in Phoenix VII and the 74 units in Phoenix VIII constitutes 551 gulf front condos in one spot. These 3 towers were all finished between 1999 and 2000. 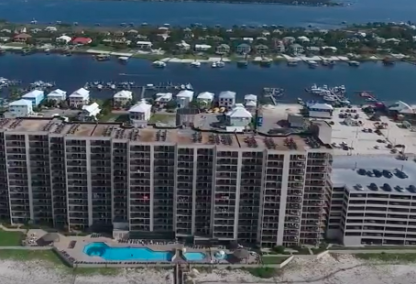 These 1, 2 and 3 bedroom floor plans range from 800 to 1,450 square feet and prices start around $230,000 Phoenix VIII has the best views of Perdido Pass as it is the closest to the jetties and this beautiful area of Orange Beach, AL. These are all located close enough to walk to the jetties at Perdido Pass and take advantage of some great inshore fishing. If you have your mind set on something different, San Roc Cay marina is just across the street and Zeke's marina is less than a mile away. Both of these marinas offer charter fishing and also have restaurants and unique beach shops for souvenirs and keepsakes. Phoenix V has 247 units that were built in 1997. The 1, 2 and 3 bedroom floor plans in Phoenix V range from 800 to 1,450 square feet and prices start around $230,000. Phoenix V is one of the older towers and the prices reflect this making Phoenix V a great way to pick up a Phoenix condo for less than many of the other towers. Phoenix III and Phoenix IV have identical amenity packages for each tower. The two buildings are contiguous and all units are direct gulf front with private balconies overlooking the Gulf of Mexico. These 2 Phoenix buildings were built between 1993 and 1995 and have a combined 195 units. The floor plans range from 700 to 2,000 square feet and prices start at $220,000. 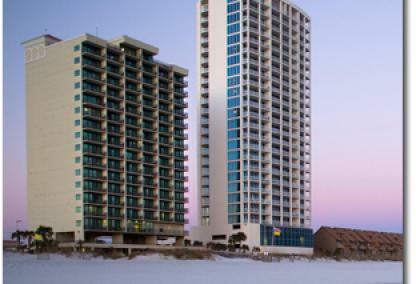 Phoenix I and Phoenix II condos are located next to one another in Orange Beach, AL. The 2 towers each house 100 units comprised of 1, 2 and 3 bedroom condos. Prices for these condos built in 1985 start around $220,000. These were the first of the Phoenix family and have aged gracefully. These units offer a great way to buy a place at the beach at a great sales price. Phoenix on the Bay and Phoenix on the Bay II are 162 and 104 units respectively. The bay front developments are comprised of 2 and 3 bedroom condos ranging from 1,300 to 2,300 square feet. Built in 2004, Phoenix on the Bay condos start around $280,000. These towers feature something no other Phoenix condo can claim; boat slips. The towers are located close to the entrance to the Gulf of Mexico at Perdido Pass in Orange Beach, AL. Phoenix All Suites is located in the heart of Gulf Shores next door to The Hangout and public beaches. Built in 2005, this condotel consists of 1-bedroom units featuring fully-equipped kitchens, hallway bunk beds, and private balconies overlooking the Gulf. Cost of units average in the lower 200Ks. Great rental potential in prime location walking distance to restaurants, entertainment, local festivals & events. Phoenix All Suites West is located in downtown Gulf Shores approximately 1 mile west of Hwy 59. The primary difference between this condo and the other gulf front condos is in the ownership. Due to the ownership agreement, the owner has limited options for many things associated with renting, using or altering the condo itself. These units start around $200,000. Click here for the newest Phoenix listings (within the past week). ReadThe Phoenix All Suites is centrally located in the heart of Gulf Shores. In an unbeatable location, residents and guests of this condominium are able to watch downtown events such as The Shrimp Festival from their own balconies. All units are gulf-facing 1 bedroom/1.5 bathroom plans and provide a full-sized kitchen. Owners are not permitted to make any interior changes to units. Onsite amenities include an outdoor pool, hot tub, BBQ area, laundry facilities, & covered parking. ReadPhoenix All Suites West condominiums are located in the West beach area and is a half a mile walk to the popular Gulf Shores Hangout Restaurant. All units are 1 bedroom/1.5bathroom and approximately 640 square feet with gulf facing balconies. Condo owners can only rent through onsite management and are not permitted to make changes to units. Property amenities include outdoor pool, hot tub, BBQ area, and laundry facilities. ReadPhoenix IX is located just east of Perdido Pass in Orange Beach and is walking distance to several attractions like Flora-Bama beach bar. Built in 2007, the 15-story condominium offers 1-, 2-, and 3-bedroom units with floor-to-ceiling windows and spacious living areas. Phoenix IX provides an excellent amenity package with indoor/outdoor pools, hot tubs, modern fitness center, and indoor air-conditioned tennis court. These condos are popular with vacationers and provide excellent rental revenue. ReadPhoenix West is one of the newest condo developments located in central Orange Beach. Built in 2008, Phoenix West provides 3 and 4 bedroom luxurious condos with spacious balconies directly facing the Gulf of Mexico. The complex provides numerous amenities including a lazy river, outdoor/indoor pools, hot tubs, tennis courts, fitness rooms, and covered parking. Phoenix West is a great investment due to its ideal location and brings in above-average rental revenue among Orange Beach condos. ReadPhoenix West II is one of the largest upscale condo developments in Orange Beach. Built in 2013, the complex features 3 and 4 bedroom units luxuriously furnished with granite counters, high ceilings, and panoramic views of the Gulf. The condo offers an excellent amenity package including a gulf-front lazy river, outdoor/indoor pools, rooftop tennis courts, covered parking, and gated entry. Phoenix West II is a highly popular vacation destination and is well-known for its high rental revenue. ReadPhoenix X sits adjacent to the Alabama-Florida line and is a popular condo development in the area. 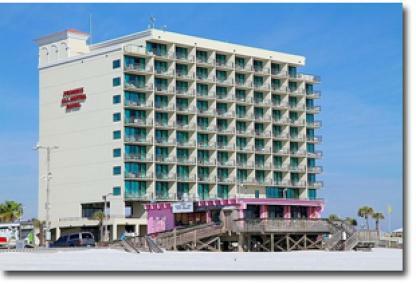 The complex is next door to Flora-Bama and is a great place to stay during events held at the famous beach bar. Floor plans range from one to three bedrooms with living spaces up to 1,395 square feet. Phoenix X offers plenty of onsite amenities including a beachfront pool, indoor heated pool, fitness facility, sauna, hot tubs, indoor racquetball, and lighted tennis courts. Orange Beach, AL has condos everywhere. There's gulf front condos, bayou front condos, bay front condos and canal front to name a few. Phoenix buildings can be found throughout Orange Beach and most have the amenities listed above. Some of the condos in Orange Beach that feature the same amenities and offer similar styles is Regency Isle in East Orange Beach. The gulf front condo has a putting green for the golf enthusiasts. Another condo with a putting green, is the Caribe and although it's not directly on the gulf, Caribe offers owners and guests beach access and shuttles run daily and a marina. Some other condos in Orange Beach similar to Phoenix is Turquoise Place, which is closest to the newest Phoenix West buildings offering luxury living on the Alabama Gulf Coast. Sea Chase and Summer House are both located in downtown Orange Beach and the buildings on Romar Beach, like Windward Pointe, Pelican Pointe and Bluewater are also similar to Phoenix condos with tennis courts, indoor pools and other great creature-comforts. 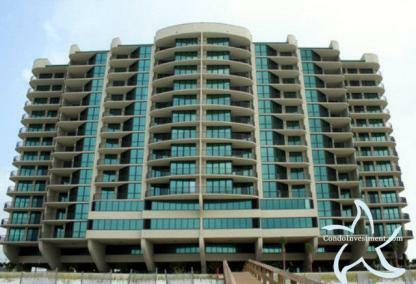 To browse these and other condos, try our Orange Beach condos sales info.